Just recently, Gold Dot created a new line for their loyal clients called BLANC. It's a more basic, price-friendly line for girls who love flats (like ME!!!). So basically, the styles are much more simpler that would cater to a bigger market among women. Kahit lahat nagsitaasan na ang heels, we can't deny that flats are still one of the most coveted shoe in the market! For GOLD DOT's first release, designer Karl Leuterio was inspired to create 3 flats: The Emi , The Esme and Eriko. Being a guy, Karl wanted to incorporate a touch of androgynous, metallic, and sportswear to the shoes hence the padded ankle straps and cut out elements of the shoes. 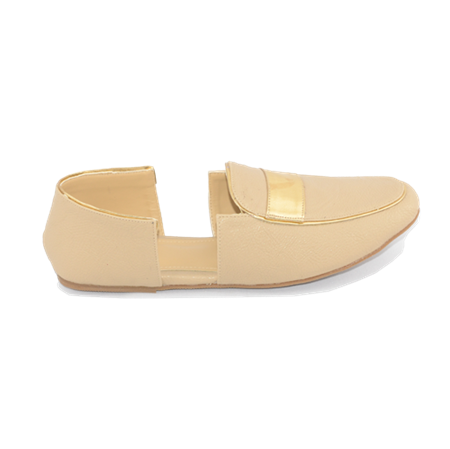 The Esme is a 2 way flats which can be both be worn in any way. It has metallic snaps at the back portion. You can snap it or not depending on the mood or outfit. The Emi ,on the other hand, were inspired by space age, future and sportwear hence the glass foil metallic palette. The last one is Eriko, a simple cut out loafer. It's extremely chic. A downplayer in any outfit however , the simple details are what sets it apart. It has a metallic feature too.